So much from our ride can be applied to business. All of it was based on the exact same principles. Basically what we did was a risk/benefit analysis. Is it likely we’ll get killed on the ride? Will we cause permanent damage? Is it likely we’ll succeed? Once we’d done all that and identified the risk as acceptable, then we moved on and started to implement strategies to minimise the risk further – engaging a personal trainer, dietician, sports psychologist, etc. You check out if your idea or business model is feasible through analysing demographics, buyer profiles, market demand, etc. Then you’ll talk with others in the industry to get a feel for the market. Then you’d check out how your competitors operate and what they do to attract clients. Of course, Jack and I had various contingency plans if things didn’t go so well. We had plans for injuries (we’d keep riding with a broken arm or collarbone, but stop for a broken leg), mechanical breakdowns (spare bike, spare parts and the phone number for every bike shop on our route) and more. Being flexible is critical to success in doing a massive ride and in doing business. If what you’re doing doesn’t work, stop doing it. And if you have planned out what that next response might be, you’re far less likely to make a rash decision. 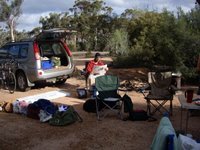 A great example from the ride was that we decided to take a camper trailer with us – this gave us the flexibility to camp where ever we wanted across the desert. This was a critical factor, because when you’re a 15 yo kid cycling across Australia you need everything in your favour. If you get a great tailwind you don’t want to have to stop after 100 kms because that’s where your hotel room is. We had a tailwind one day and did a massive 260 km ride – a ride that gave us a massive psychological boost (not to mention getting us ahead of schedule).